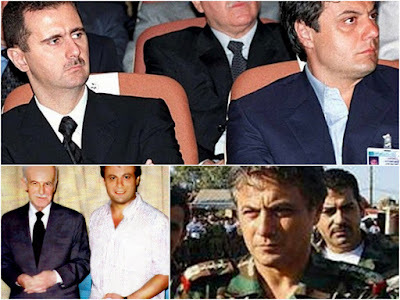 ArabSaga: Would Gen. Manaf Tlass ease Assad’s way out? The Syria uprising entered a dramatic new phase with today’s killing in a bomb attack in the heart of Damascus of at least four of President Bashar al-Assad's top security aides. They are Defense Minister Gen. Daoud Rajha; his deputy Assef Shawkat (who is Assad's brother-in-law); former defense minister and current Assistant Vice President Hassan Turkmani; and Hafez Makhlouf, head of Intelligence Agency investigations and brother of business tycoon Rami Makhlouf. Several security officials were also seriously wounded in the attack, including Intelligence chief Hisham Bekhtyar and Interior Minister Mohammad Ibrahim al-Shaar. The attack on the headquarters of Syria's National Security Council in the Rawda area is a deadly blow to the heart of the regime after two recent high-level defections – by Syria's ambassador to Iraq, Nawaf al-Faris, and a Republican Guard general, Manaf Tlass. News of the devastating blow to Assad’s regime broke while I was working on the post below. For a while, I thought the post has probably been overtaken by events. The Supreme Council of the Armed Forces (SCAF) oversaw the transition in Egypt from Hosni Mubarak to Mohamed Morsy. Would world powers refine the SCAF template and choose a body of senior officers in the Syrian military to oversee a Syria transition plan? If so, would Brig-Gen. Manaf Tlass, a Sunnite member of President Bashar al-Assad’s inner circle and commander of one of Syria’s elite Republic Guard units who moved to France earlier this month, turn into Syria’s Hussein Tantawi? Tlass yesterday called for a political transition in Syria and condemned military attacks on civilians in a statement sent to AFP. Expressing anger that security forces were being used to suppress dissent, he said the regime held “the major responsibility” for the crisis and confirmed he was in Paris. “I sincerely hope the blood stops flowing and the country emerges from the crisis through a phase of constructive transition that guarantees Syria its unity, stability and security, as well as the aspirations of its people,” said Tlass, a childhood friend of Assad. “I am ready like any other Syrian, with no other ambition, to fulfill my civic duty to contribute to a better future for my country, as much as I can, and like all those... who have already made many sacrifices,” he said. However, he did not specifically call for Assad to step down or say he was joining the Syrian opposition. “I cannot but express my anger and pain at seeing the army pushed to carry out a fight that is against its principles, a fight directed by security forces and in which the people, including the soldiers, are the victims,” he said. Writing for today’s edition of the Lebanese pro-Assad daily al-Akhbar, Nasser Sharara gives an invaluable insight into the reasons behind Tlass’ flight to France. To this day, the way Manaf Tlass left Damascus remains a mystery to the Syrian security services. Manaf did not break with Assad. He kept saying his clash was with the security services bigwigs who had Assad’s ear. Manaf’s disaffection was with “the political solution saboteurs.” Media reports that he sulked at home after taking off his military uniform are false. Even when slamming “spoilers” in the security services, he kept turning out at his office in the presidential palace and at the headquarters of Presidential Guard Unit #105, which he commanded. An Alawite State in Syria?